If all you’re looking for is to get away from the maddening chaos of the city, then Pondicherry is where you must head next. From beautiful beaches to gorgeous sunsets; French architecture to delectable food, this tropical paradise has much to offer. The best way to reach Pondicherry is to take a flight to Chennai and then drive on the ECR road for about 170km. Sunsets are universally held in high regard, and rightly so, because there’s nothing as beautiful as the sun going down on a beach. Sunrises too, are quite a spectacle for that matter. And Pondicherry is just the right place for both. The place has a few sunrise points for catching a sunrise, and for the sunset, one must head to the Promenade beach. Serenity Beach about a 20-minute drive from the town is a close second and deserves a mention as well. A must-experience to have at Pondicherry is at the Ousteri Lake or Lotus Lake. Here you can row your boat amidst a sea of floating lotus flowers that go as far as the eyes can see. The century-old man-made lake is a hidden gem situated about 10km from Pondicherry and is ideal for nature lovers and birdwatchers alike. South India is known for its rather vibrant temples; and Sivan Temple of Villianur is among the most famous ones. It calls for a visit to this temple located just 8km from Pondicherry, very close to Ousteri Lake. Then there’s Auroville, a small town where people are devoted to towards humanity, looking beyond man’s aspiration for perfection. Matrimandir stands at the centre of it; and perfect silence is observed inside so as to not break the sense of tranquility in the air. A place worth a meal in Auroville is the Bread and Chocolate; a vegan restaurant where every single item is prepared with exquisite perfection and fresh ingredients. What’s a visit to Pondicherry without having traversed the lanes of White Town. This is where you’ll find the vibrant French houses with hanging veranda, quaint little cafes and super clean streets that can give Paris a run for its money. 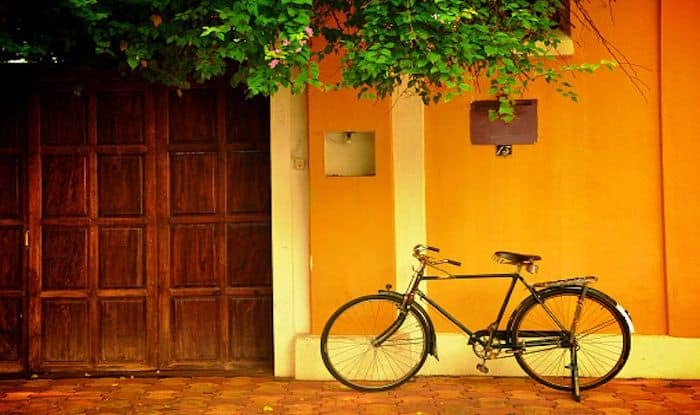 In addition to being a great place for a chilled out getaway, Pondicherry actually is also a great place to shop. Most of the shopping happens on Mission Street where you can look for ceramic tableware and ornaments, terracotta toys and trinkets, incense and scented soaps as well as candles, hand-made paper lamp shades, Buddha on stone carvings, brass statues and dream catchers.